The F.Mk.8 Meteor was the final day-fighter version of the RAF's first jet fighter, first appearing in late 1948. By 1950, the Mk.8 was the mainstay of RAF Fighter Command, a position it would maintain until 1955 when the Hawker Hunter began to equip RAF fighter squadrons. It was also the mainstay of the squadrons of the Royal Auxiliary Air Force until that service was disbanded in 1957. The Meteor F.Mk.8 was chosen by the Australian government to equip 77 Squadron RAAF, then serving in Korea (despite the overwhelming request by the pilots for the F-86. Entering combat in 1951, the Meteor quickly demonstrated that no matter how maneuverable it was, it was no match for the MiG-15 in air combat; only the individual skill of the RAAF pilots saved them from suffering worse losses than they did, and the squadron was relegated to standing airfield alert at Suwon before being assigned to ground attack, where they were quite successful. The Meteor next saw combat with the Israeli Air Force, which had obtained 12 F.Mk.8s and F.R.9s (five of which were equipped as F.8s), the first of which arrived in August 1953, with the last arriving in the spring of 1955. The Meteors stood quick-reaction alert at Hatzor in 1954-55, and on September 1, 1955, two Meteors shot down two Egyptian Vampires strafing a kibbutz in the Negev, these being the first air combat victories by the Israelis since the end of the War of Independence. The Meteors were assigned to ground attack missions in 1956 with the arrival of the Mystere IVA for the air-combat role, and served in this role during the 1956 Sinai War where they proved particularly effective against Egyptian armor and suffered no losses. The surviving Meteor F.8s were removed from operational status in 1962 with the arrival of the first Mirage III fighters. The Meteor F.8 also served in the Egyptian, Syrian and Iraqi Air Forces, but only saw limited service with the Egyptians to no effect during the 1956 war. Additionally, the aircraft served with the Royal Netherlands Air Force, the Belgian Air Force and the Brazilian Air Force throughout the 1950s. Its final service in the RAF was as an unmanned drone during the nuclear tests at the Woomera range in Australia in the late 1950s. 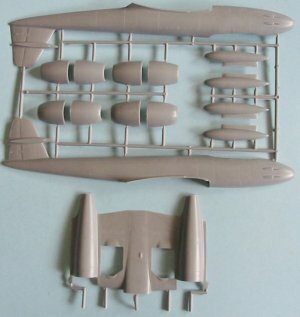 The only other 1/48 Meteor F.8 available has been the Aeroclub mixed-media kit, which is very good. For those vacformophobes, the new Classic Airframes injection-molded release will allow modelers to equip their collections with this famous early jet. The kit is very good - it can be considered the best yet from Classic Airframes - who have ended their relationship with MPM. Surface detail is even better than that of the Tamiya Meteors, other than that the dive brakes are molded closed. The kit provides both types of intakes for the early-production and late-production version. In England, the "Hannant's Special" has both the early and late production canopies in one kit, while elsewhere Classic Airframes has released the model in two different versions, with one canopy type in each. 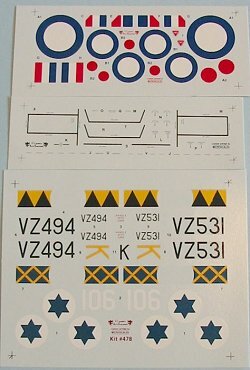 The Hannant's Special has decals for one Israeli Meteor of 117 Squadron, as well as Meteor 8s of 501 and 609 Squadrons, Royal Auxiliary Air Force, all three of which are camouflaged. Hannant's has also done a really excellent decal sheet in their Xtradecal range, which includes no less than 9 different Meteors in both silver lacquer and camouflage, both early and late production versions. The Classic Airframes early version, Kit 466, includes decals for "Halestorm," a MiG-killer from 77 Squadron in Korea circa 1951, and a Meteor of 56 Squadron circa 1953; both of these are in the overall-aluminum lacquer finish. The late-production kit, number 467, has markings for the Israeli Meteor and the 501 Squadron Meteor as in the Hannant's Special. 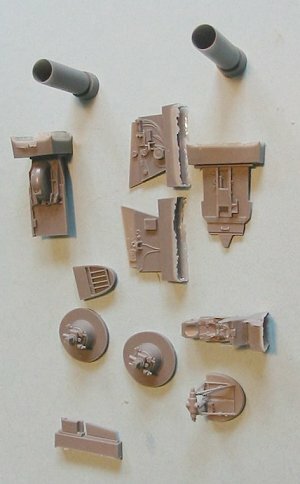 Of particular note is the resin cockpit. This comes in grey resin and is almost indistinguishable from the injection-molded parts as regards color. The seat has molded harness detail and looks very good, while the rest of the parts show the simplicity of the Meteor cockpit - since it comes in one color, black, this is actually a good thing. Additionally, the canopies are injection-molded and, while a bit thick, will look good once dipped in Future. This is the Meteor F.8 modelers have wanted for what seems to me to be forever. 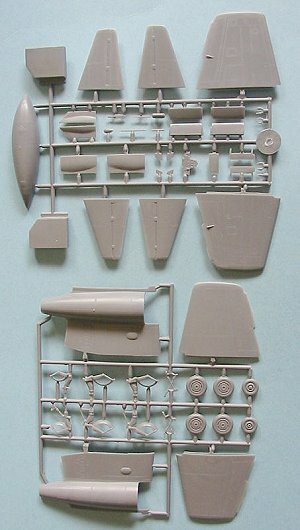 Made from the Aeroclub/Warpaint drawings and extensive measuring and photography of an F.8 in the prague Museum, the kit is accurate in both outline and detail, and looks easy to build for a limited-run production. Only a dedicated sense of self-restraint while finishing another important project keeps me from diving into all three of these simultaneously like a ravening beast. But I will - and soon! The word is, the F.Mk4 will be out by the end of October, followed by the T.7 in time for the UK-IPMS show at Telford, with the night fighter in time for Christmas. It's not hard to see why this kit has set a sales record at Hannant's since its release, staying at #1 for two weeks and showing no sign of decrease. It is excellent value for the money.